RBH provide better places for their members, tenants and employees to live and work. Why re-brand? After extensive research RBH decided that a re-brand was required. They decided to keep the RBH name as it was well recognised, however they felt that their visual identity needed to match the society’s values. By involving all stakeholders, RBH created a new logo and visual identity which better reflects their mutual values; ‘People succeeding together’. “We have a rather large fleet (around 200 vehicles) which means we have a visible presence across the borough. We’re really keen to raise the profile of RBH; the opportunity to maximise this free media space on our vans – was a great way to get our message across to current and potential customers. It was a no-brainer – we know that our vehicles spend considerable amounts of time parked within our communities; but we also benefit from the ambient marketing to potential customers when they are on the road”. Rather than just applying the new logo on the fleet, RBH used the re-branding of the fleet as a golden opportunity to communicate important key messages to their clients, with each service having a different message alongside the new logo. With 13 different designs and 8 different vehicle types in the fleet it was vitally important that the production systems and installation procedures were 100% accurate. PVL created individually labelled and packaged vinyl kits for each of the 200 vehicles and a detailed fitting schedule to minimise downtime for the working vans. Each of the vans had to have the old livery removed, glue residue removed and the new livery applied, all within the allocated one hour fitting slot. 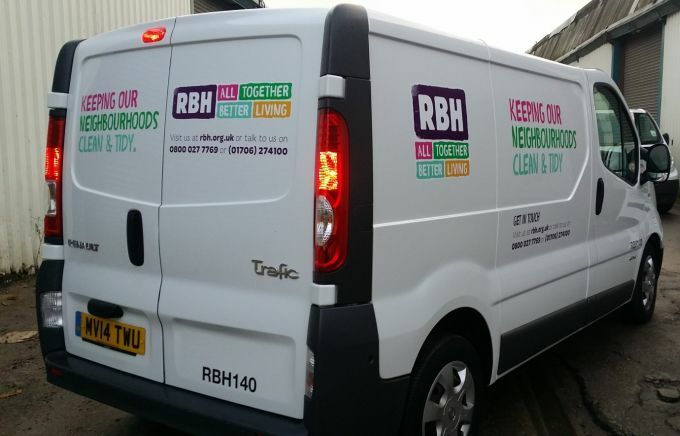 The RBH fleet was successfully re-branded on time, with high quality printed graphics communicating a range of important messages all day every day. “PVL demonstrated a flawless commitment to helping us with our new identity, were meticulous in their attention to detail, and have provided outstanding customer care. They showed patience, when needed, and proved highly flexible. We would definitely be happy to work with PVL again”.